For the month of April, we explored Switzerland. We have enjoyed learning about many things about Switzerland and from Switzerland. Switzerland is officially the Swiss Confederation and is a small landlocked country in Europe. It is a very mountainous country with the Alps and Jura as some boundaries of the country. "LocationSwitzerland" by User:Rei-artur - Original by User:Vardion, Image:A large blank world map with oceans marked in blue.svg. Licensed under CC BY-SA 3.0 via Wikimedia Commons. Switzerland is known for many things including St. Bernard dogs, the Red Cross, fondue and so much more. For lessons on Switzerland one could focus on Henry Dunant and the foundation of the International Red Cross; St. Bernards and how they have saved people in the mountains; and artists like Paul Klee. 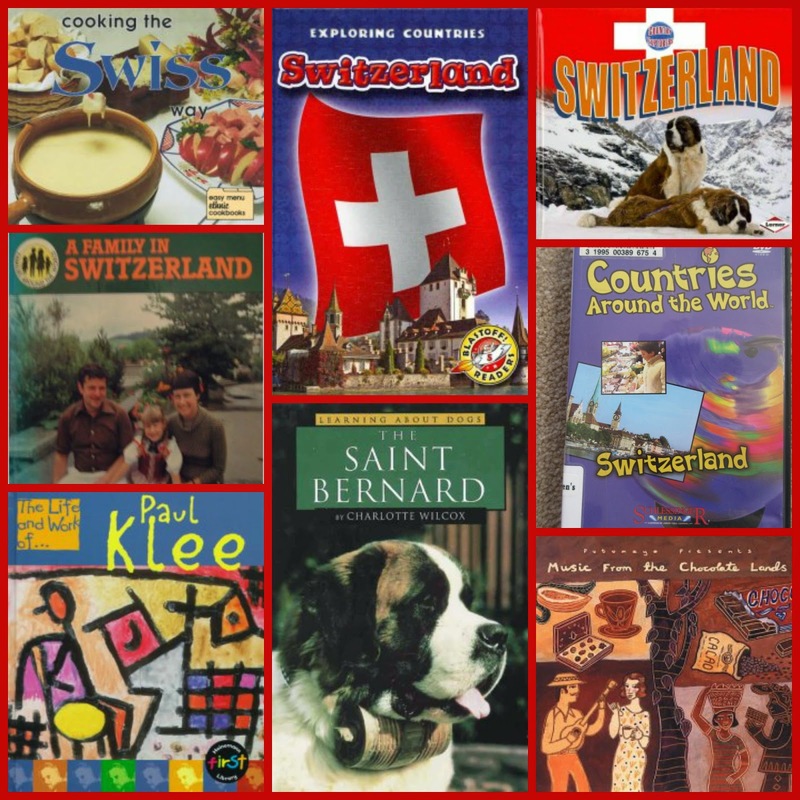 Here are some of the resources we used to learn a bit more about Switzerland and its culture. 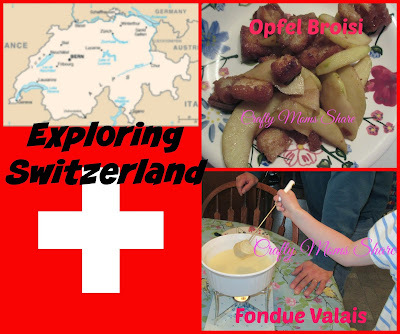 The DVD from the Countries Around the World introduced Hazel to life in Switzerland and also showed her cheese fondue. This became a must cook food for us to try. Hazel loved making the cheese fondue and eating it. She wants to try chocolate fondue and meat fondue as well. 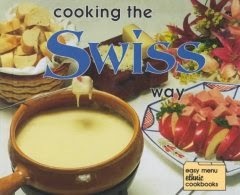 We used a recipe from Cooking the Swiss Way by Helga Hughes and adapted it with the method from the DVD. Prepare the food you will use with the fondue. Mix the cheese and flour with your hands and set aside. Rub the garlic clove along the edges of the fondue pot. 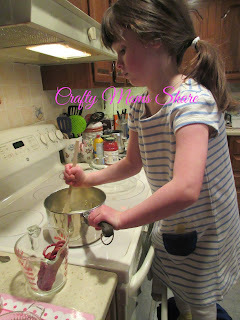 Pour milk into pot (either fondue pot if it can go on stove or small pot) and warm it on the stove. Add lemon juice and paprika. Then add the cheese one handful at a time stirring constantly. When all the cheese is melted, it is ready to put in fondue pot. 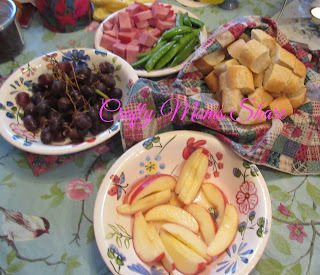 We were having the fondue for dinner so we used cubes of ham, French bread, grapes, sugar snap peas and apple slices (covered with lemon juice to prevent browning). 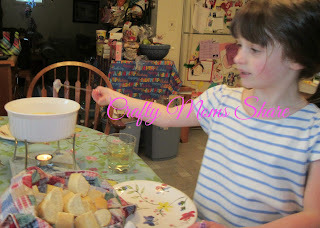 We had so much fun dipping our food. Luckily I had a chocolate/cheese fondue pot (and a meat fondue pot). 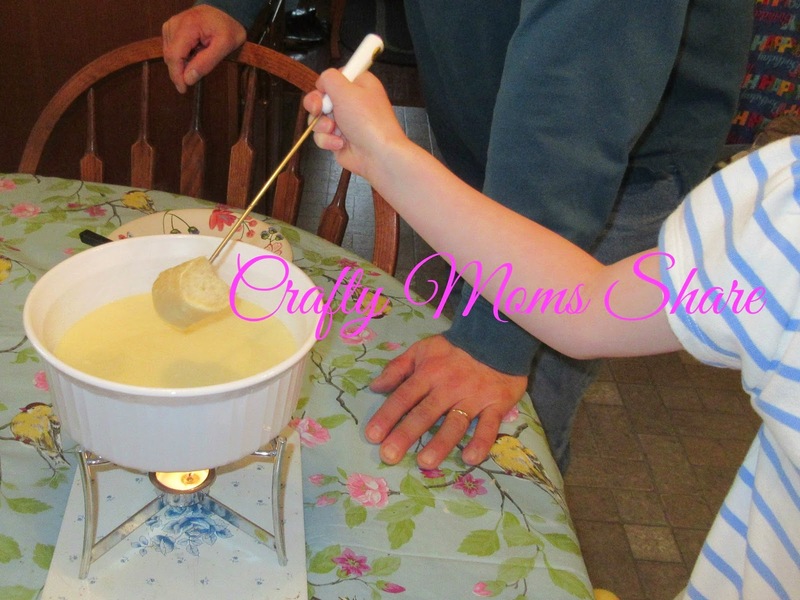 I had many fondue pots from having fondue parties when I was single. In our exploration we also enjoyed reading stories from Switzerland. Of course the most famous is Heidi by Johanna Spyri. Since this is a long chapter book, I found some adapted picture books and an easy reader. 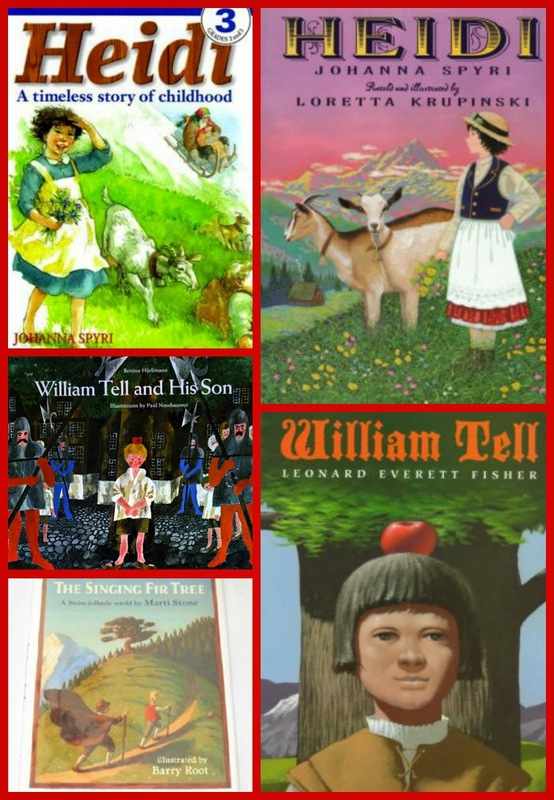 The other famous legend from Switzerland is William Tell. He is the man who had to shoot an apple off his son's head with a bow and arrow. We found several books telling this legend as well. The second recipe we tried goes perfectly with this story. 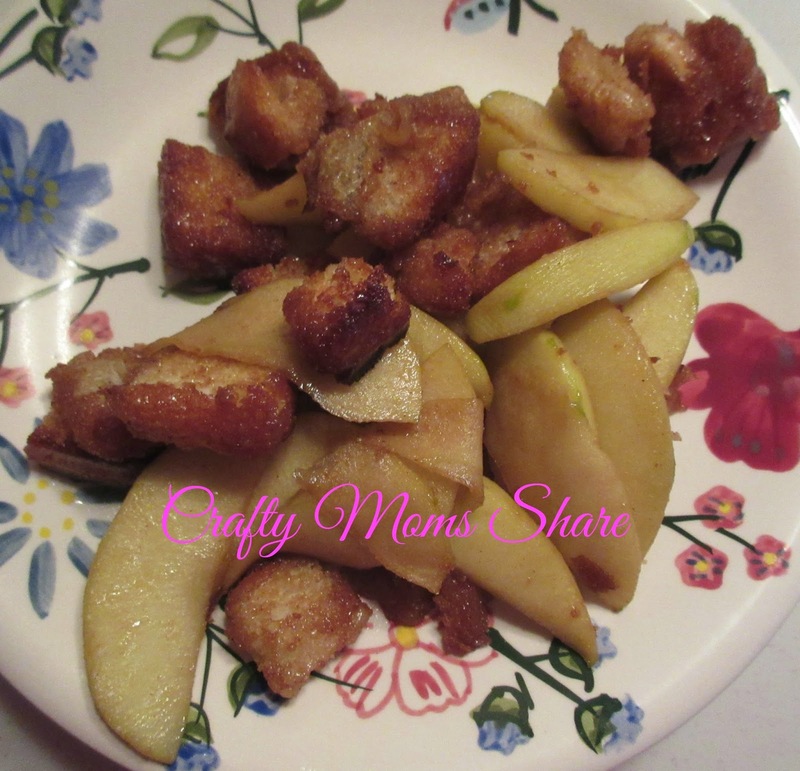 It was Fried Apples and Bread Slices and the recipe is from Cooking the Swiss Way as well. 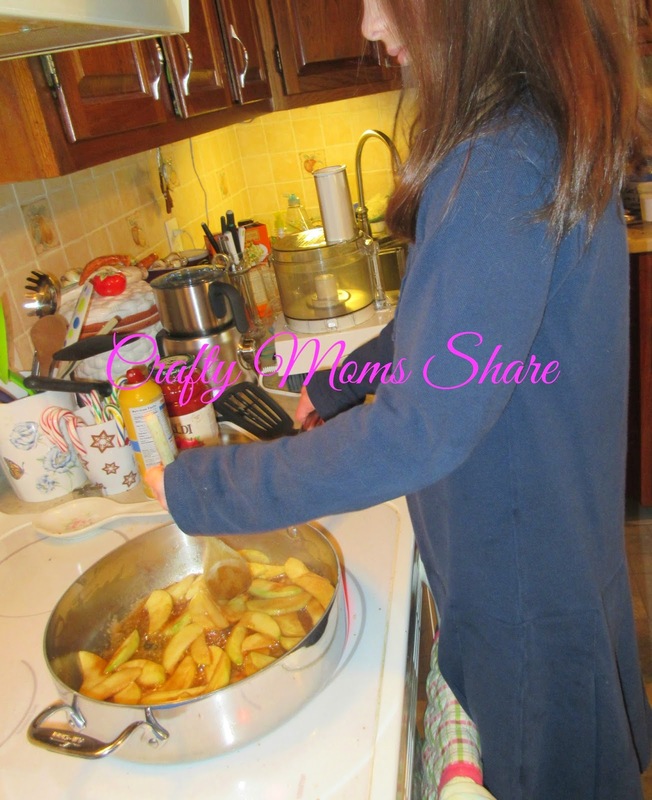 The recipe is very similar to this one on Food.com with the addition of a dash of cinnamon. Hazel did the cooking--I did the cutting. Then we both enjoyed this delicious breakfast! That is our exploration of Switzerland. Have you explored Switzerland? Please share your own Swiss explorations here.